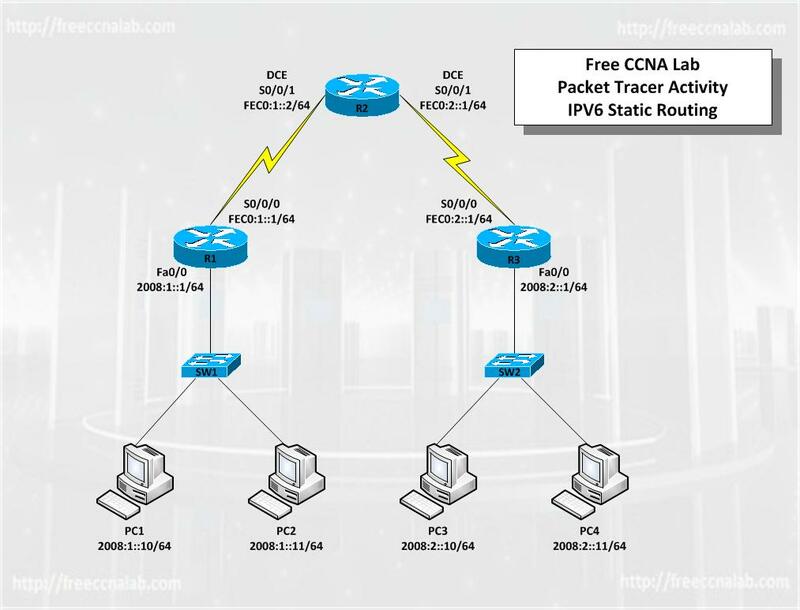 In this Free CCNA Lab you will configure three routers in a simple IPv6 configuration. Routing will be established using Static routes. Finally you will use the Show and Ping commands verify and test the configuration and connectivity of the network. You can configure a static IPv6 route to be redistributed into a routing protocol, but you cannot redistribute routes learned by a routing protocol into the static IPv6 routing table. Before configuring a static IPv6 route, you must enable the forwarding of IPv6 traffic on the router using the ipv6 unicast-routing command and enable IPv6 on at least one interface by configuring an IPv6 address or explicitly enabling IPv6 on that interface. Most labs contain the topology, finale config, and some instructions.